Six Degrees | Advertising and AI Influencers: Unlimited, Unregulated…But Effective? 14 Feb Advertising and AI Influencers: Unlimited, Unregulated…But Effective? It may come as a surprise to many that a product created by Crocs would sell out in less than 10 seconds. Yes, you read that correctly…Crocs, the brand that makes the rubber hoof-like clogs many consider the ugliest shoe ever developed. Crocs paired up with the rapper Post Malone to design and release a limited-edition pair of Posty Crocs. One Instagram post of Post Malone in the shoes got everyone hooked: their first collaboration sold out in 10 minutes, leading them to release a second collaboration which sold out in just 10 seconds. While some may look at this scenario and think it’s a classic case of simple celebrity endorsement, I don’t believe Crocs could have achieved a 10 second sell-out with just any celebrity. People went crazy for these limited-edition Crocs partly because they like Post Malone, but also due to the authenticity of the collaboration: Post Malone already wore Crocs and he very rarely does product promotions. Celebrities have become increasingly large influencers for the trends, ideas, and products we consume. However, as celebrities participate in more and more sponsorships, and as it becomes more obvious which products are sponsored due to FTC rules and regulations, many celebrities are losing their trustworthiness and are shortening their value and lifespan as cutting-edge influencers. Currently the Federal Trade Commission has guidelines in place requiring influencers disclose when they are paid to promote a product or brand in order to make ads transparent and identifiable as ads. However, those rules only apply to HUMANS. Lil Miquela is a fictional CGI character that has become an Instagram influencer with millions of followers. She wears the newest designer clothes, goes to Coachella, and hangs out with the Olsen twins. She even takes a stance on social issues, is a beauty editor for Dazed Magazine, and has partnered with Prada for an advertising campaign. Lil Miquela was developed by Brud, an LA-based startup with a focus on artificial intelligence and robots. 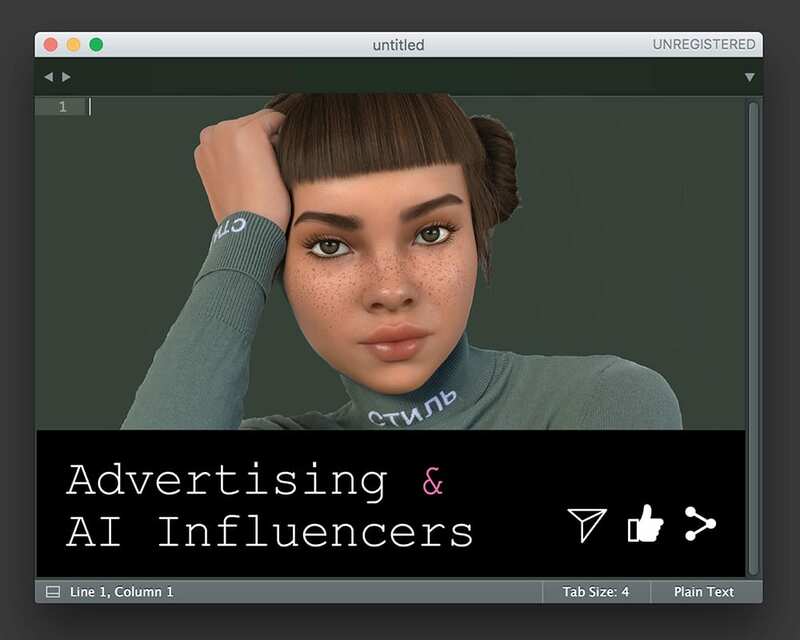 Lil Miquela and other AI influencers are a perfect fit for companies aimed towards millennials who want to seem creative and cutting-edge. Furthermore, companies who work with Lil Miquela can completely control the image created. Celebrities and human influencers can’t keep up with someone who can be many places at once, remains forever youthful, needs no sleep, can be edited to match any brand’s specifications or new trend, and is unlikely ever to be caught up in a criminal scandal. Due to the lack of regulation of non-humans in technology and social media, there is no limit to the number of undisclosed paid promotions that could be occurring in one of Lil Miquela’s posts. She, and advertisers, can seamlessly appear in our feeds and our reality. No one can deny the impact that celebrities still play in advertising; consider how Post Malone made a pair of Crocs one of the hottest releases of the year with one Instagram post. Some argue that AI influencers will never be as successful as real celebrities and human influencers because they doubt AI figures will be able reach the same level of emotional connection and authenticity of a real person. However, with all the editing and advertising that fills social media, is Lil Miquela really any more fake than the social media presence of Kim Kardashian? We live in a time when parents forgo immunizing their children against childhood diseases – in spite of the science demonstrating its value – based on some other people’s opinions. or where a President of the United States can disregard facts in order to hold a more preferred perception of an issue. So, really, what reason is there to challenge that consumers will not increasingly disregard the distinction between a human endorser and a nonhuman one?